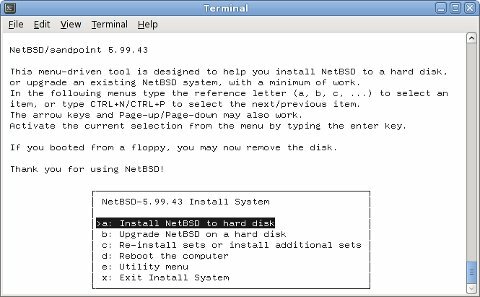 To install NetBSD/sandpoint you will have to open the case, to get access to the serial console, and connect a serial converter from TTL to RS232 signal levels. 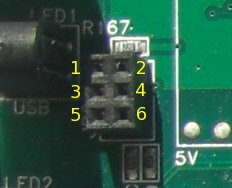 There is a 6-pin header near the LEDs, labeled JP2. 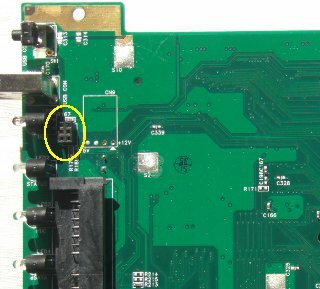 On the V1.02 board it is a male connector with pins (left picture), while it is a female socket on V200 boards (right picture). Nevertheless, the signal assignments on both connectors are the same. Provided the serial converter is installed and working correctly you should be able to connect to the firmware's serial console. QNAP is using U-Boot, the Universal Boot Loader. Now you can connect with any terminal program to the Turbo Station's serial console. The easiest approach may be to use NetBSD's tip(1) command to make a direct console connection at 115200bps. Immediately after switching your Turbo Station on it will display the following information (output is from a TS-101) and gives you two seconds to stop autobooting. U-Boot 1.1.2 (Aug 28 2005 - 13:37:25) QNAP System, Inc. 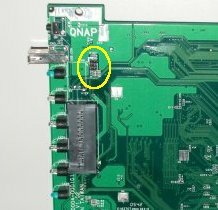 The altboot(8) utility functions as a bridge between the QNAP firmware and the NetBSD kernel startup environment. NAS firmware often provides no means to boot a kernel from disk or from the network and doesn't initialize all hardware correctly. We will also use it to pass a bootinfo list to the kernel. The last option is prefered once the installation is completed, but obviously it is not possible for the first time boot. As QNAP's U-Boot also lacks network functionalities in this version, we will download altboot into RAM with Kermit protocol over the serial line. Now quit your terminal program and launch kermit cmdfile. When you are already running kermit enter the command mode by typing CTRL-\ followed by C. Then send altboot.bin. Reconnect when the transfer is finished. The root-path option is only needed when using NFS and should match your exported NFS directory. Uncompress netbsd-INSTALL.gz from the NetBSD/sandpoint distribution and copy it into the NFS or TFTP directory. At the time of writing the network transfer will fail for the first time after cold start. After an automatic reset, caused by five xmit failures, it should succeed. This will hopefully improve in future. To find a suitable place in the Flash ROM you can use the flinfo command and look out for empty sectors (E). On my Turbo Station I have chosen 0xffe20000. Replace that in all the following commands if you have chosen a different address.